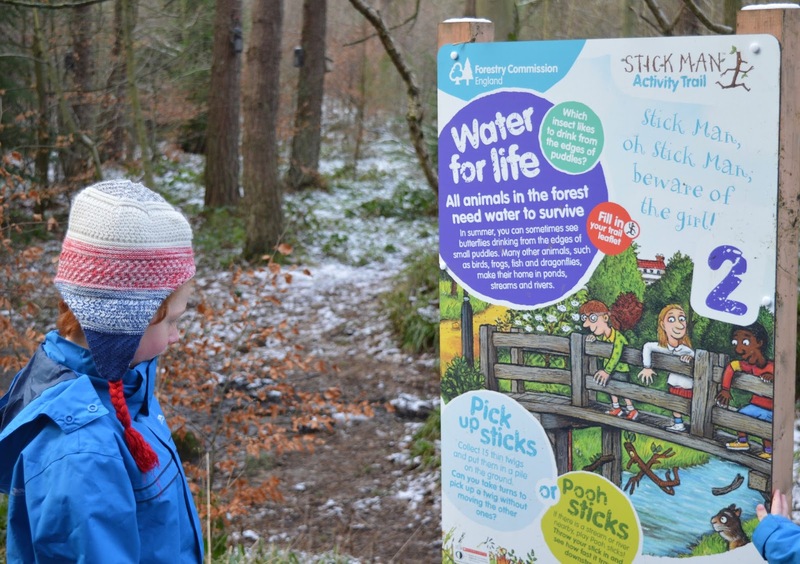 We are proud to be working with The Forestry Commission for the second year running as one of their ambassadors. 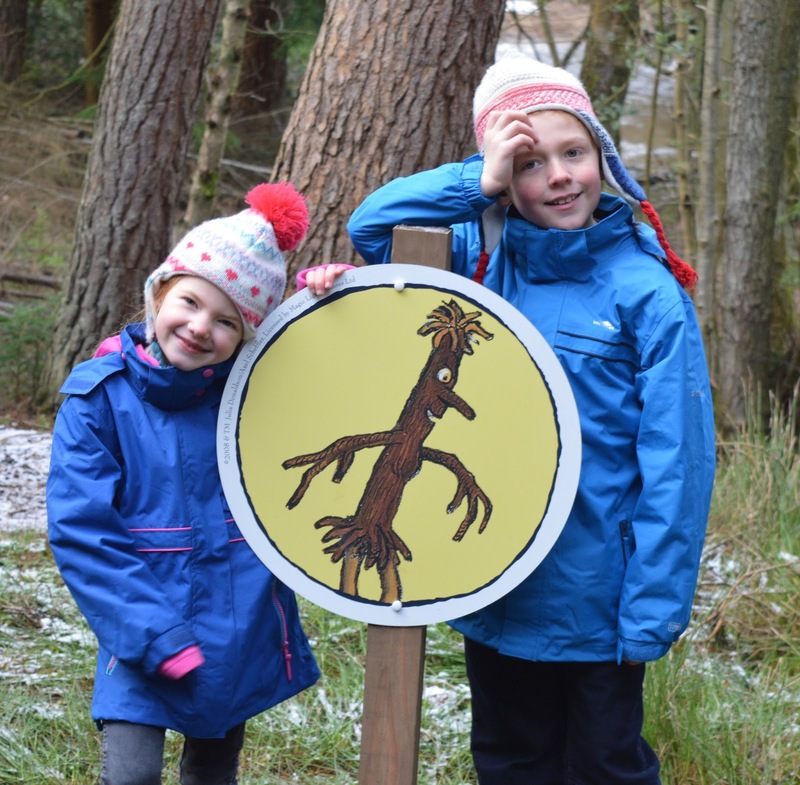 Nothing beats getting out and about in the fresh air with the kids, whatever the weather and we love, love, love their new Stick Man Trail and can't wait to share our experience with you. 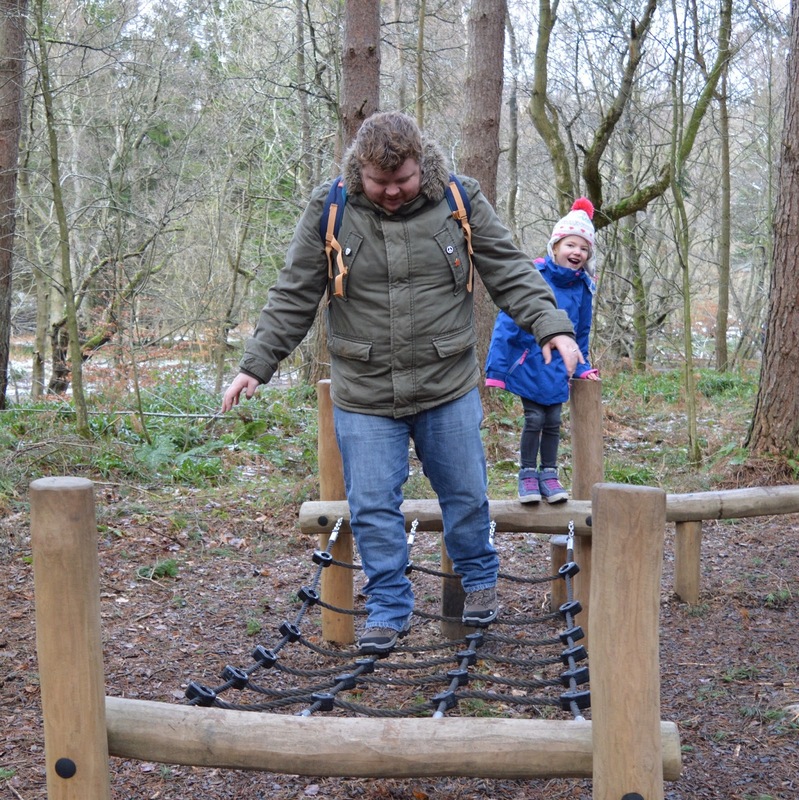 There are over 20 Stick Man trails across the country with Hamsterley Forest in Durham and Kielder Forest in Northumberland being the two that are the easiest to access in the North East. 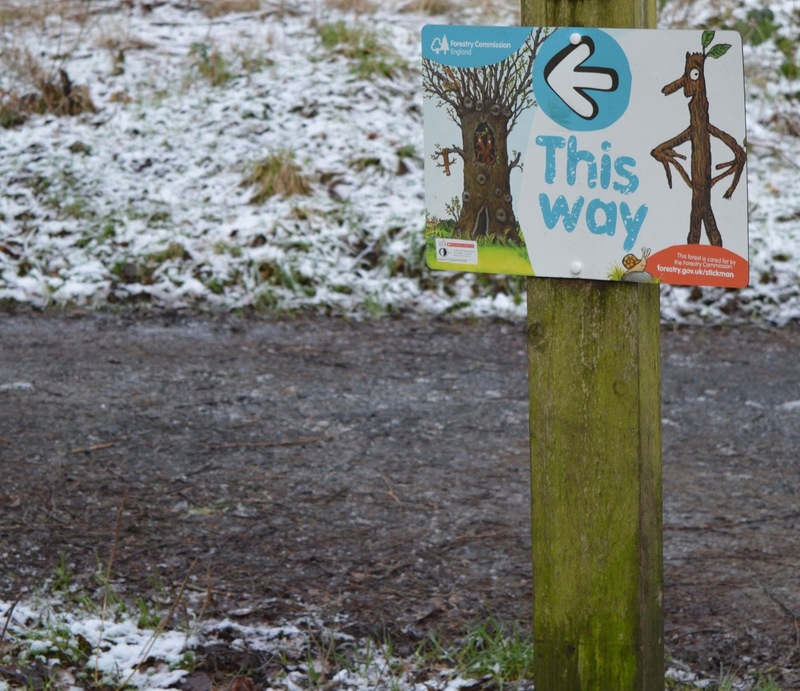 The trails are FREE although we would recommend picking up an activity pack from the visitor centre for only £3 which includes lots of additional Stick Man fun. 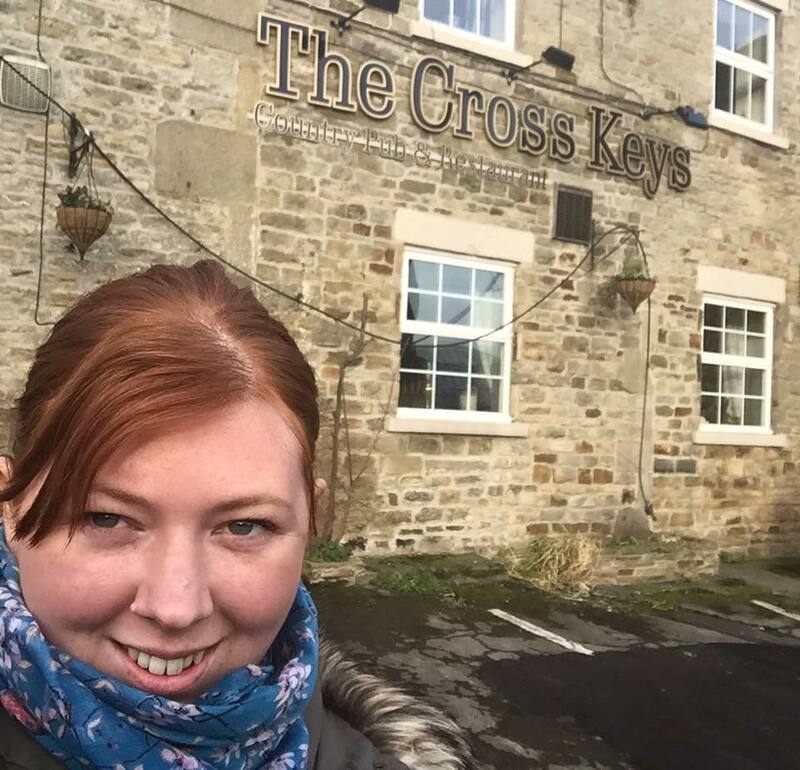 A quick search on google told me that The Cross Keys Pub in Hamsterley was only 2 miles away from Hamsterley Forest so we decided to pop in for lunch. 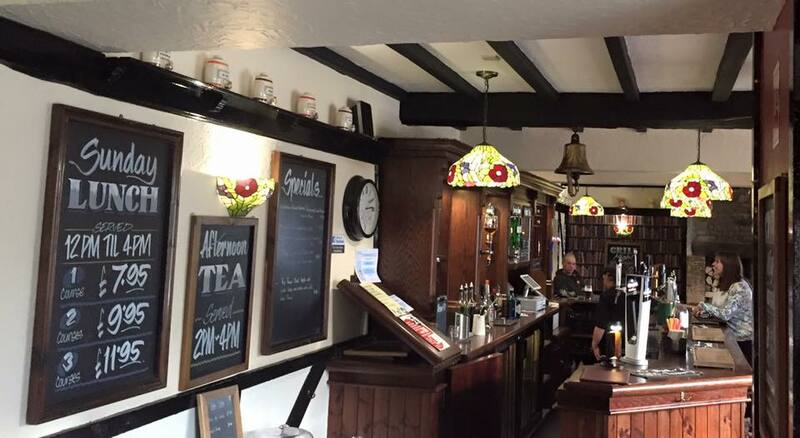 The pub was traditional in style with friendly staff and a dog lying by the roaring fire. 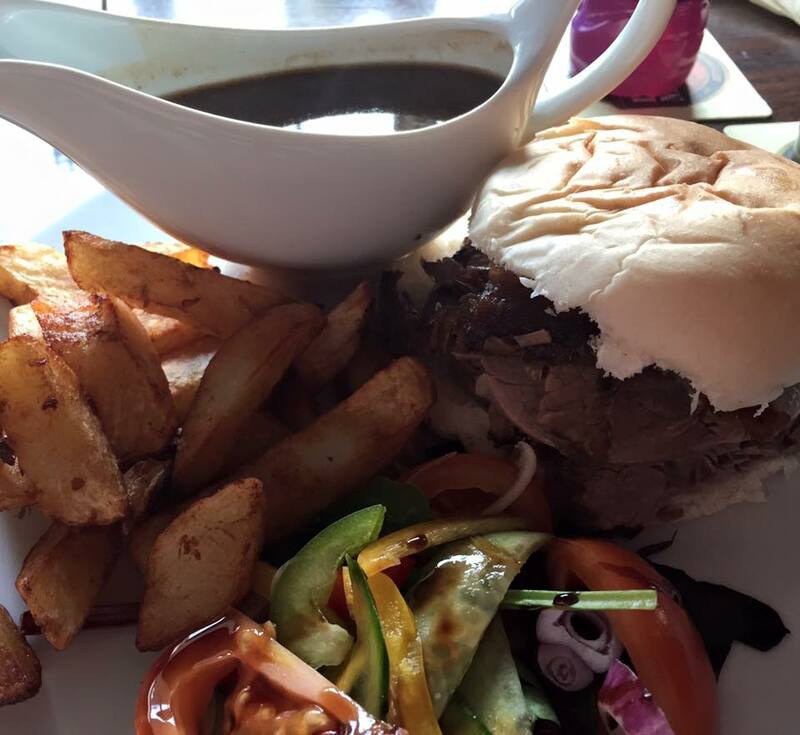 We dined from the 'light bites' lunch menu and ordered a hot beef sandwich with chips and gravy whilst the kids dined from the children's menu which was a bargain at £3.95 including a drink. Our bill was less than £25 including drinks (Steve even ordered a pint) for the 5 of us. Considering the beef had been carved from a proper joint and the chips for us all were homemade, this lunch has to be the bargain of the century! 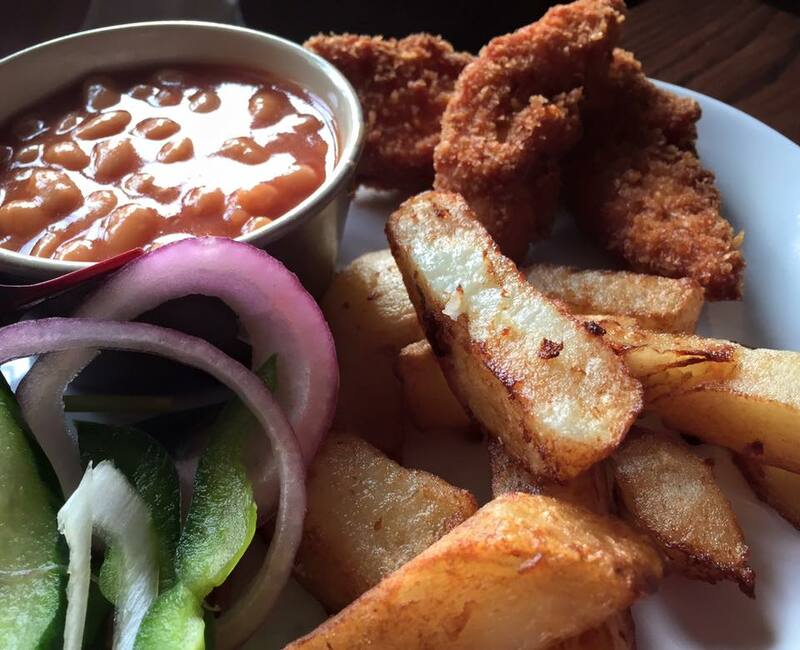 They also offer a delicious looking afternoon tea for just £5.95. The evening menu is a little more expensive than the lunchtime menu so if you'd like to grab a bargain make sure you pop in before 5pm. 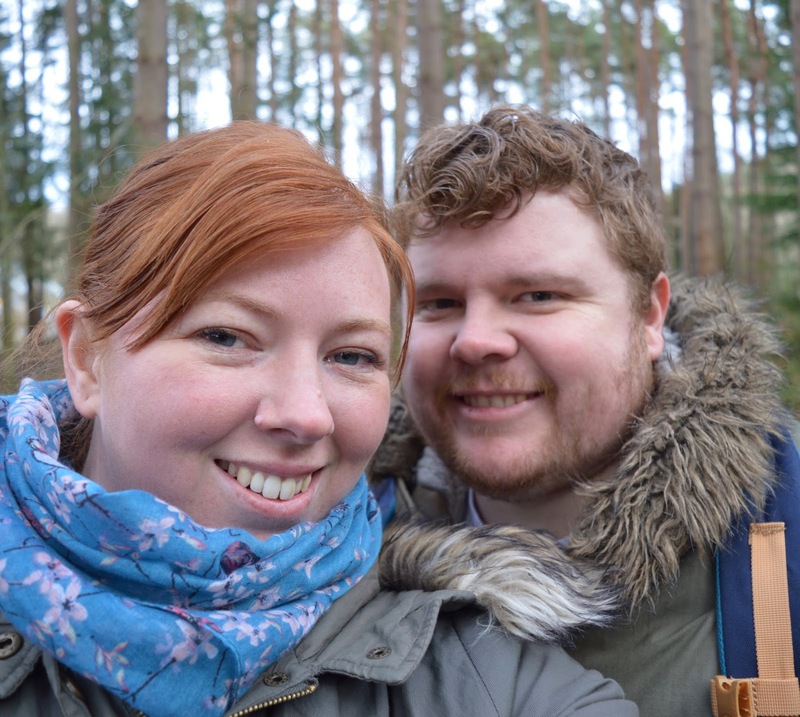 After our delicious lunch we made our way to Hamsterley Forest which is a couple of miles from The Cross Keys. There is ample parking priced at £1.50 per hour, £4 per day or FREE for discovery pass holders. 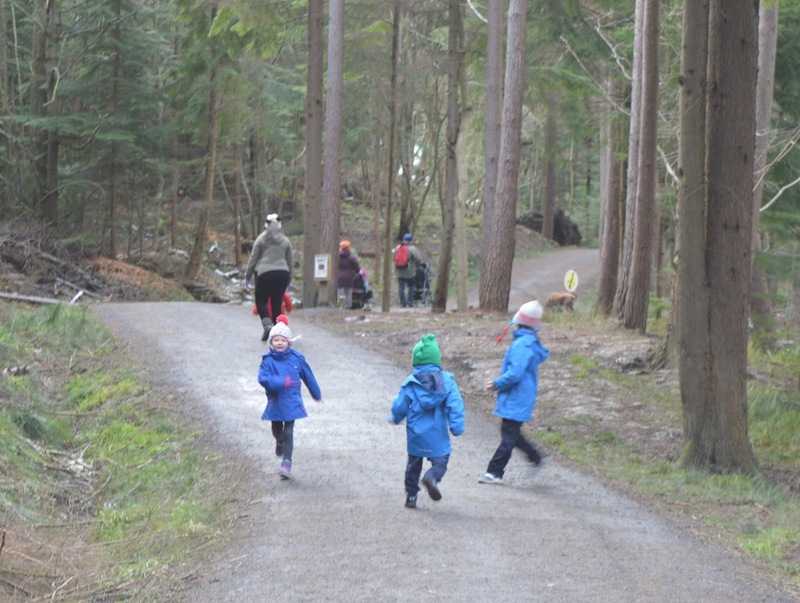 Despite the snow, the forest was filled with excited toddlers, children and dog walkers plus enthusiastic cyclists preparing for one of the forest's cycle trails. 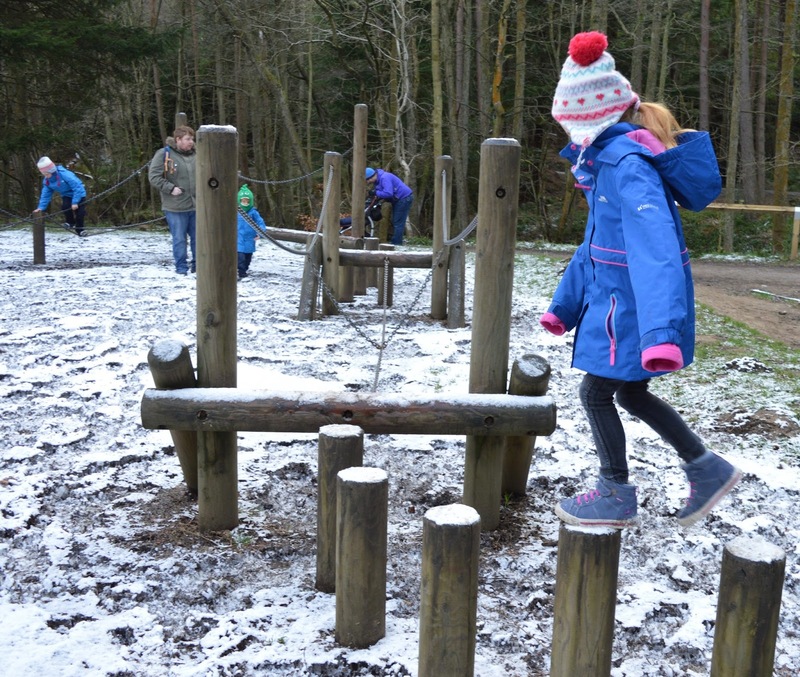 As soon as you enter the forest there are lots of natural adventure activities that are a challenge for all ages and abilities. 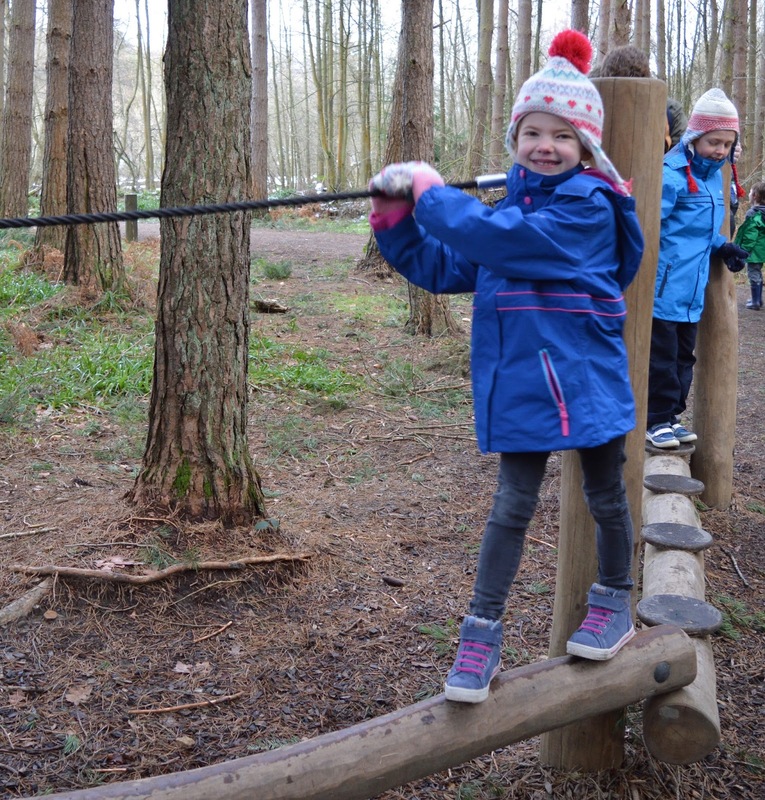 We loved balancing, climbing and swinging through the forest. Even dad had a turn! 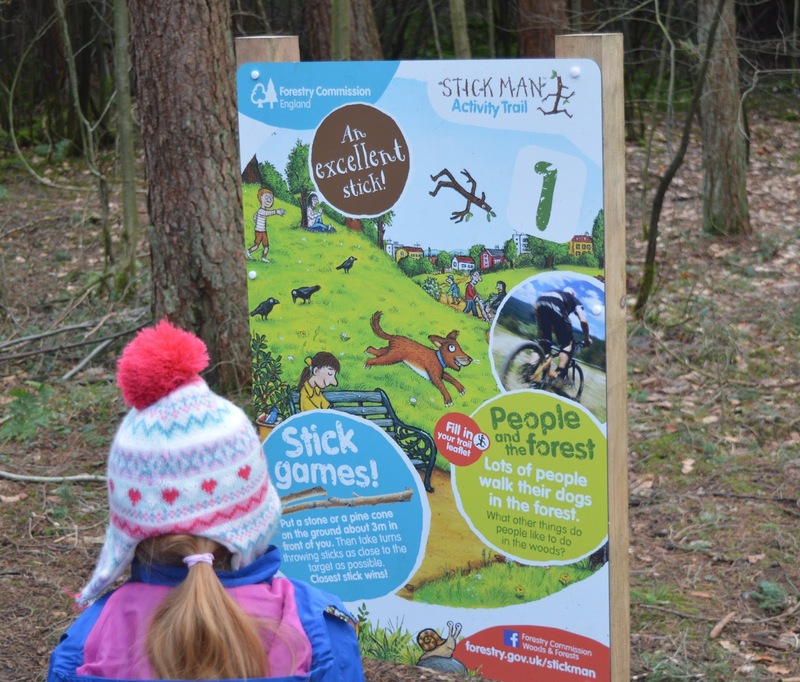 The Stick Man Trail is well signposted and features activities throughout the forest to get everyone involved. 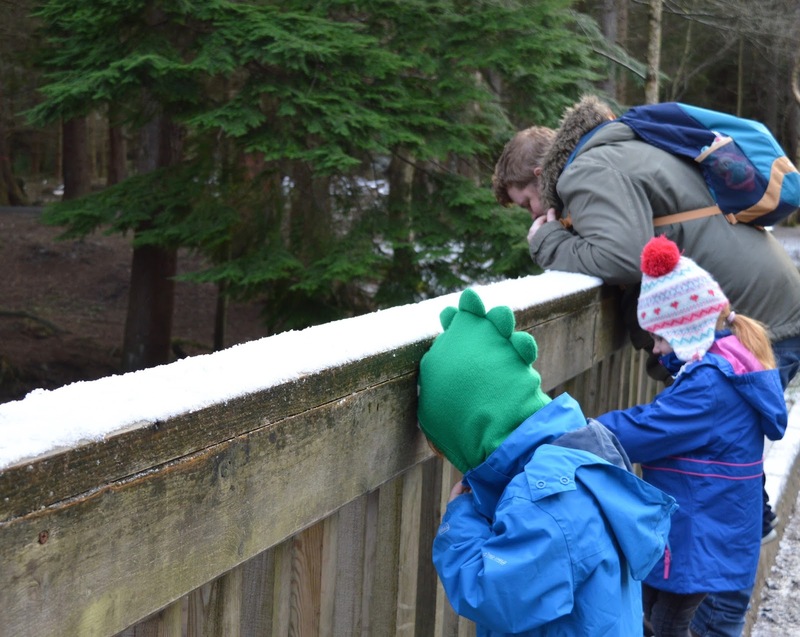 We enjoyed various stick games, acting like animals and playing Pooh sticks on the bridge amongst others. 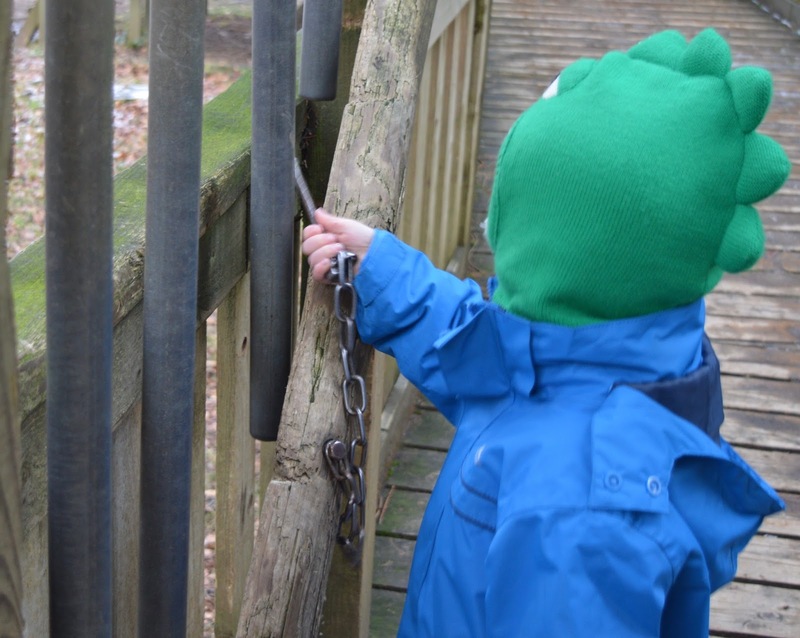 The kids thoroughly enjoyed this and as soon as they noticed a board would break into a run towards it and read us the details of our next challenge. 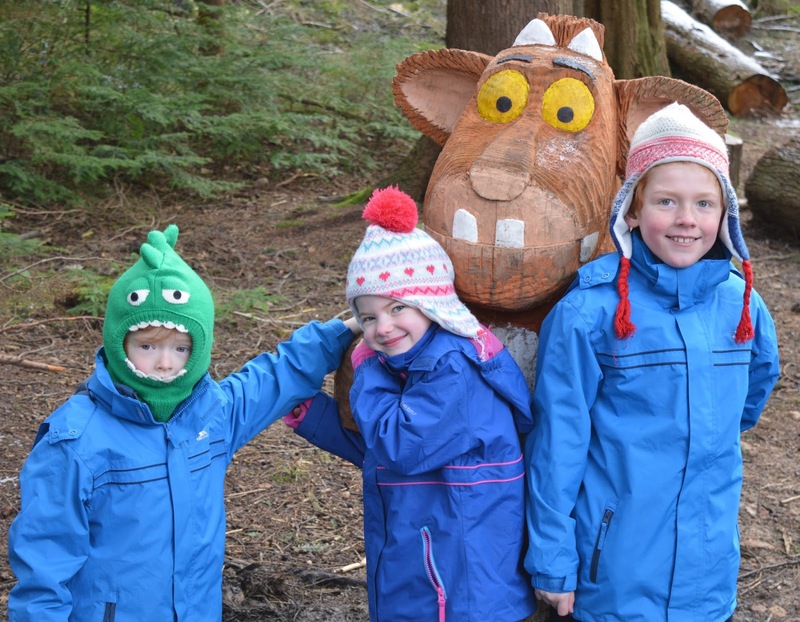 We were DELIGHTED when we spotted both the Gruffalo's child and the Gruffalo in the forest. 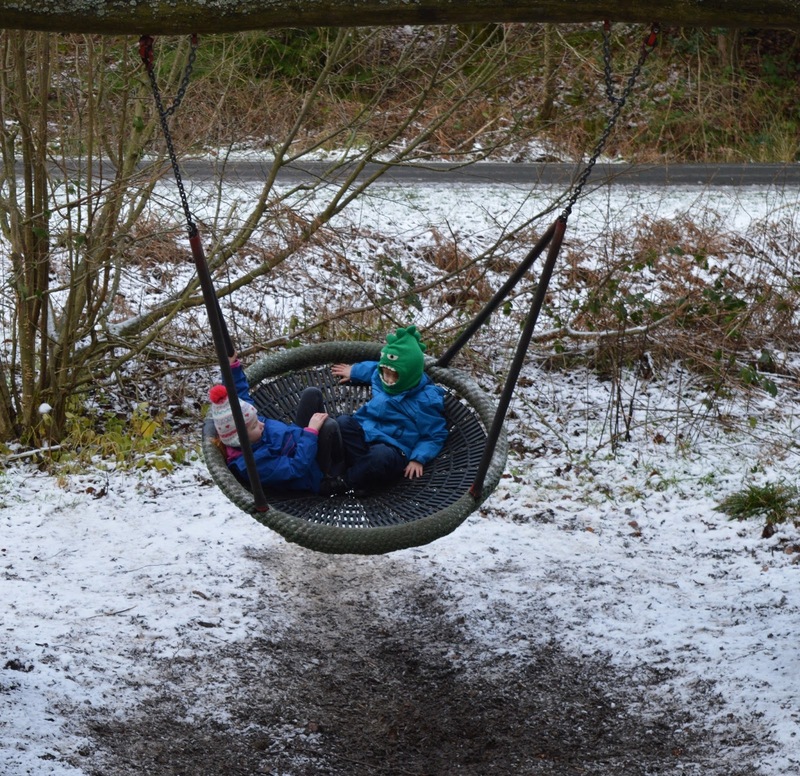 I think my children were actually more excited about spotting them than they were on Christmas Day! 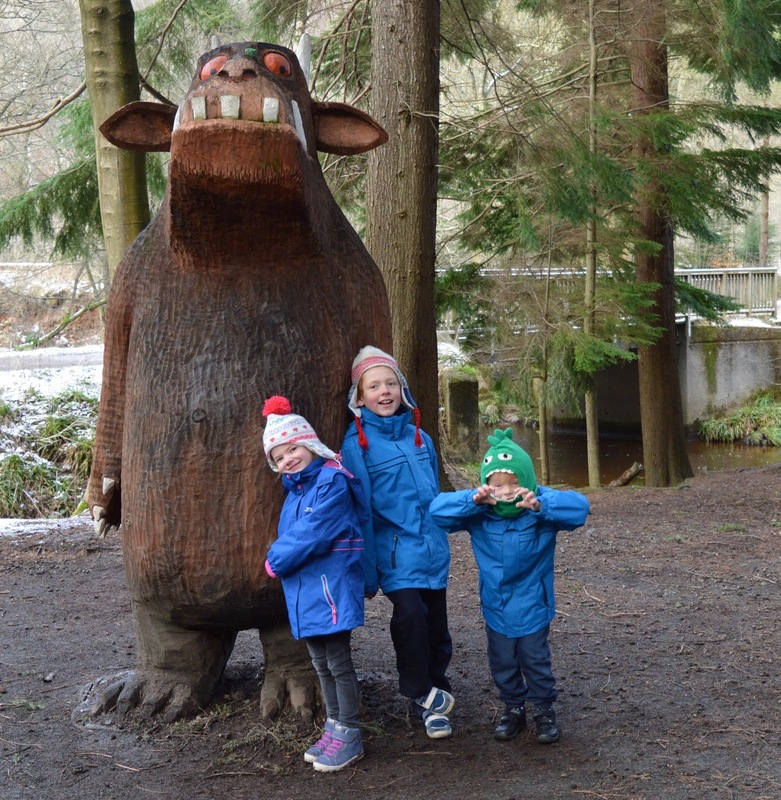 We even witnessed a few children crying as their parents told them it was time to move on from the Gruffalo. Bless! 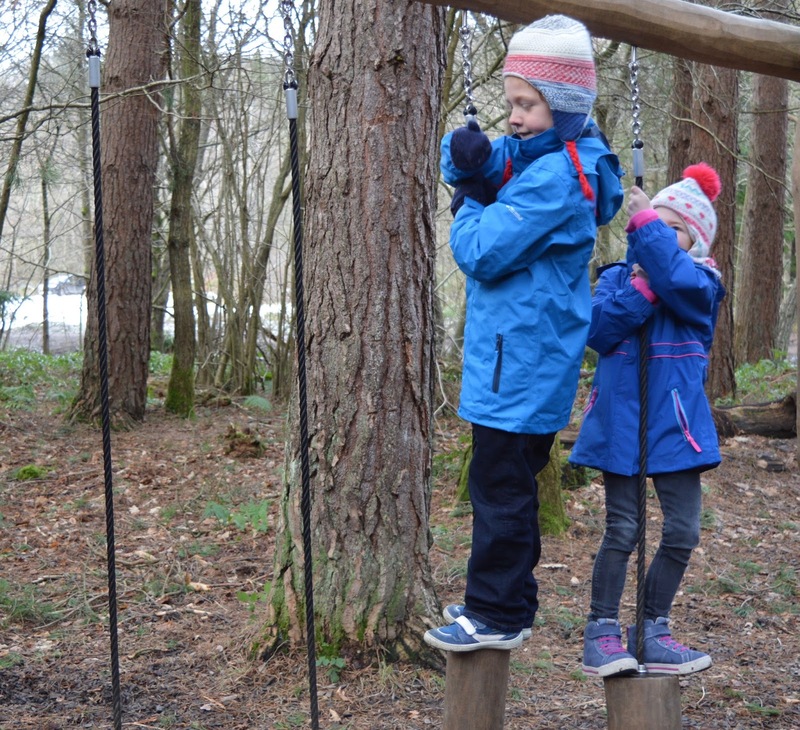 After the first couple of activities you will stumble upon a fantastic natural adventure playground with places to climb, poles to slide down, swings to try and even a few musical instruments. Our three love it here and we stopped for our first picnic of the year (and in the snow) at one of the nearby tables. 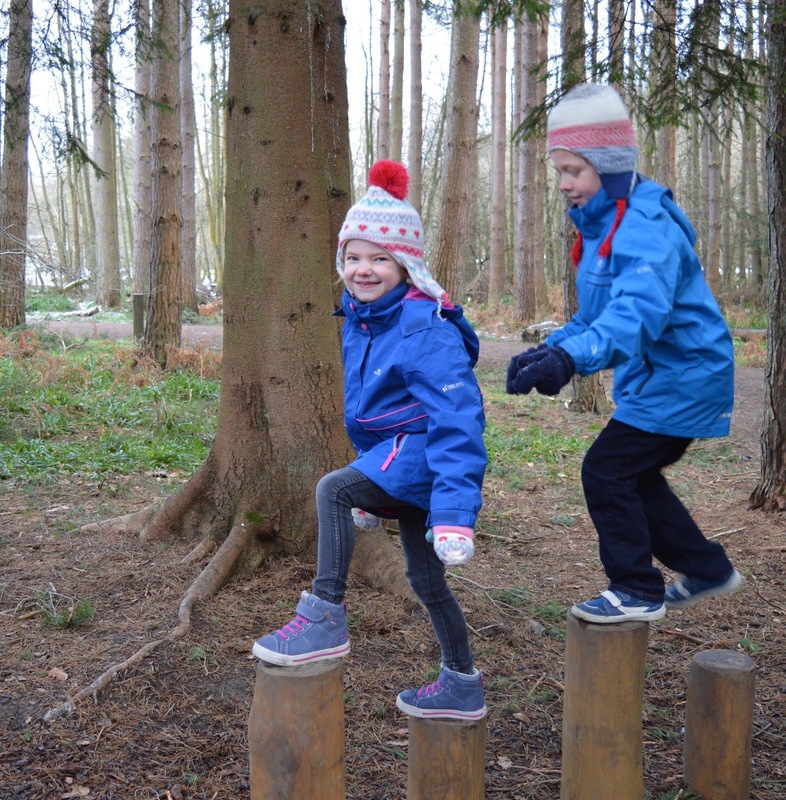 Heidi is wearing her new 3 in 1 waterproof jacket and the boys are wearing matching Sulivan Boys' 3 in 1 waterproof jackets which are both available from Trespass.com (currently in the sale too). 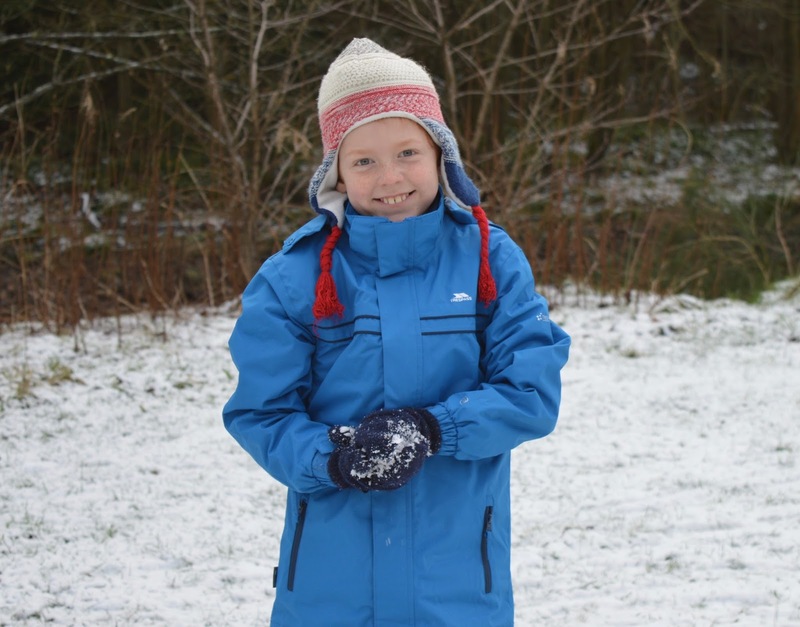 Their jackets are layered with a warm cosy fleece which features technology that actually stops heat from leaving the body and can be worn separately. They are topped with a water and windproof jacket with zipped pockets and tapered seams to stop any water (or snow in our case) from entering through their cuffs. 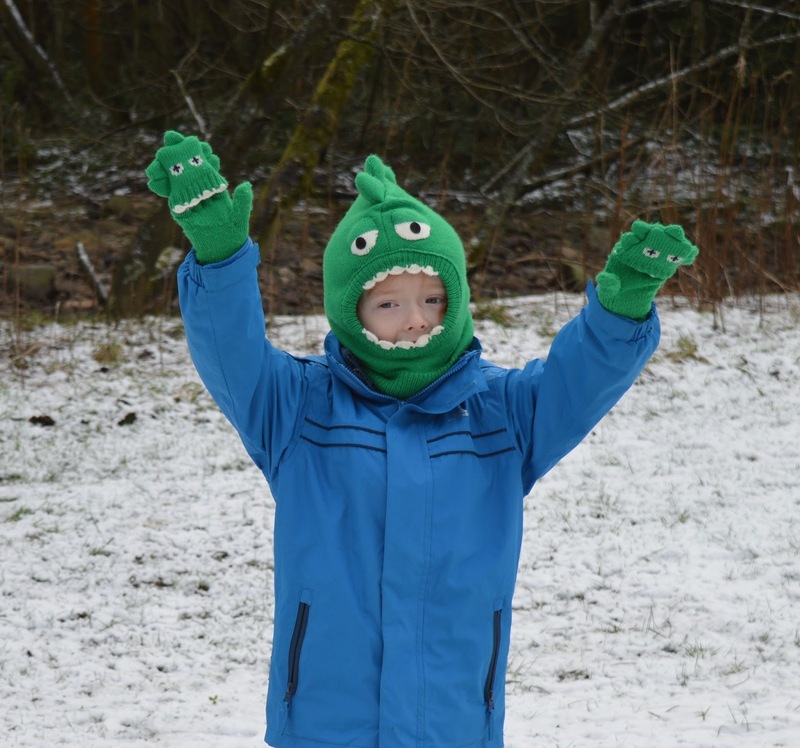 The trail was pretty chilly and our three didn't complain once about the cold (which is a first) and I like how these coats can be zipped right up over the chin for extra warmth or opened a little should they need to cool off. They also feature a detachable hood. 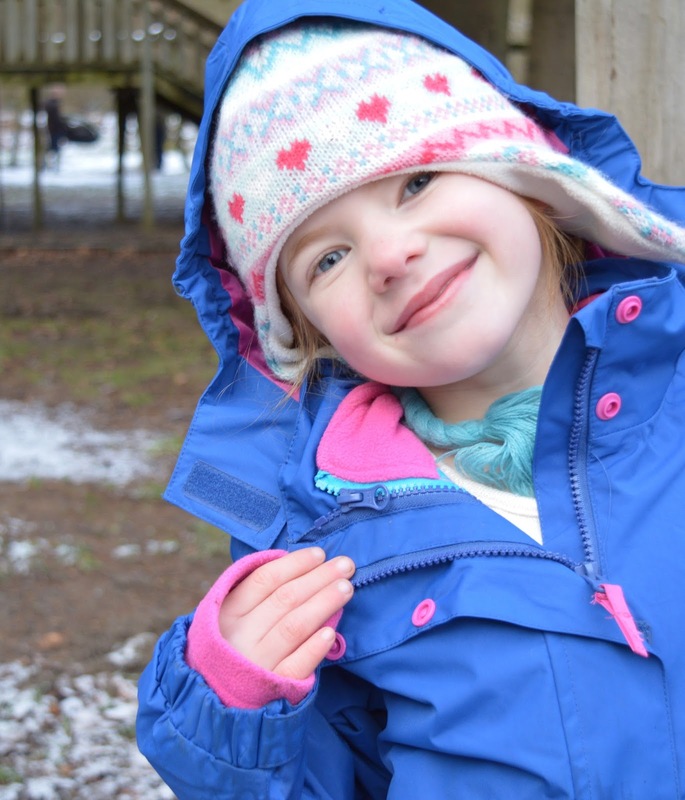 Heidi wouldn't normally wear this style of coat but I haven't been able to tear her away from it and she has been wearing it every day for school. 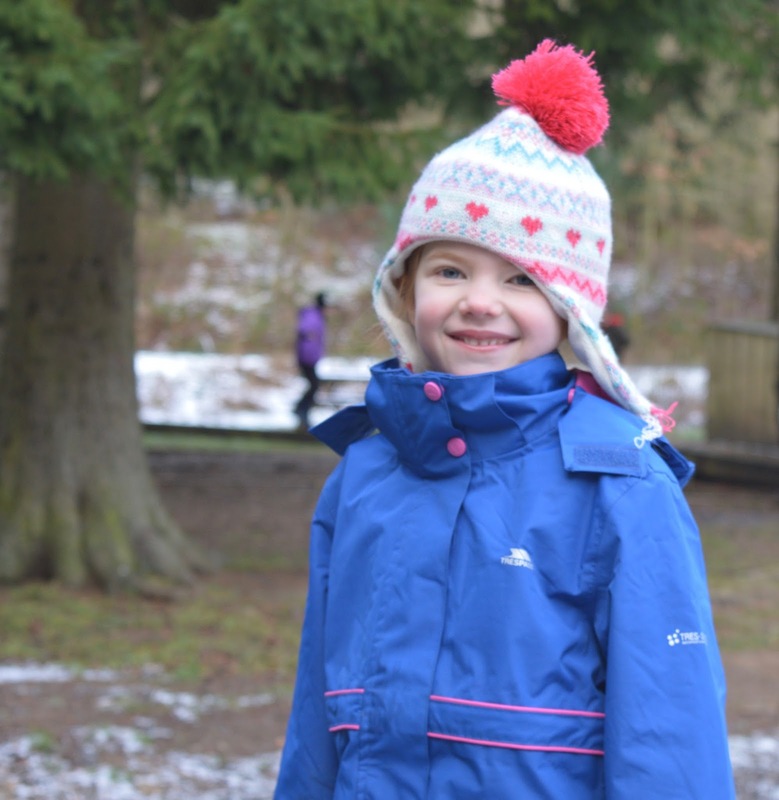 She loves it and I'm very impressed with the quality so I will definitely be looking at investing in Trespass coats for the kids again next year. 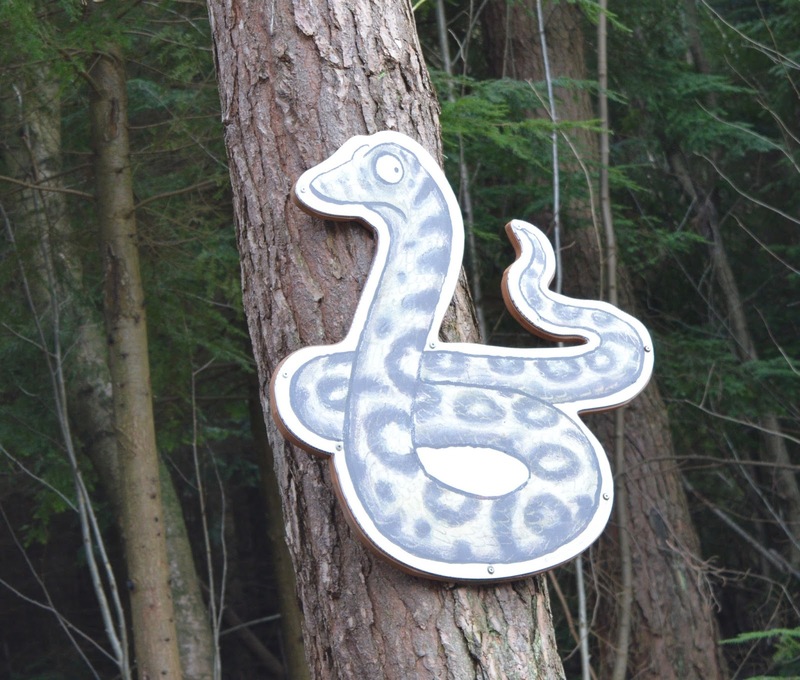 I love how each of the trails has its own little twist even when the trail and activities are the same. 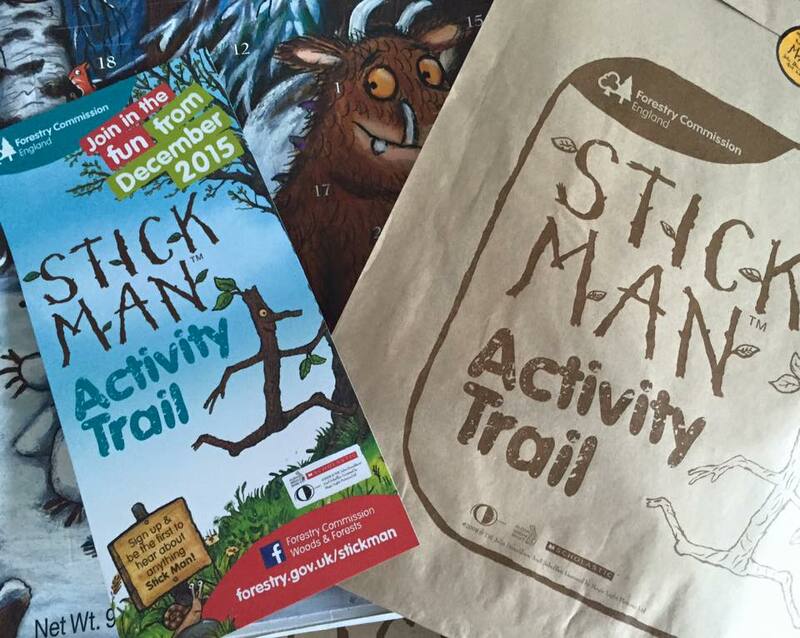 We went to our closest Stick Man after Christmas and it was great, a really fun day out. 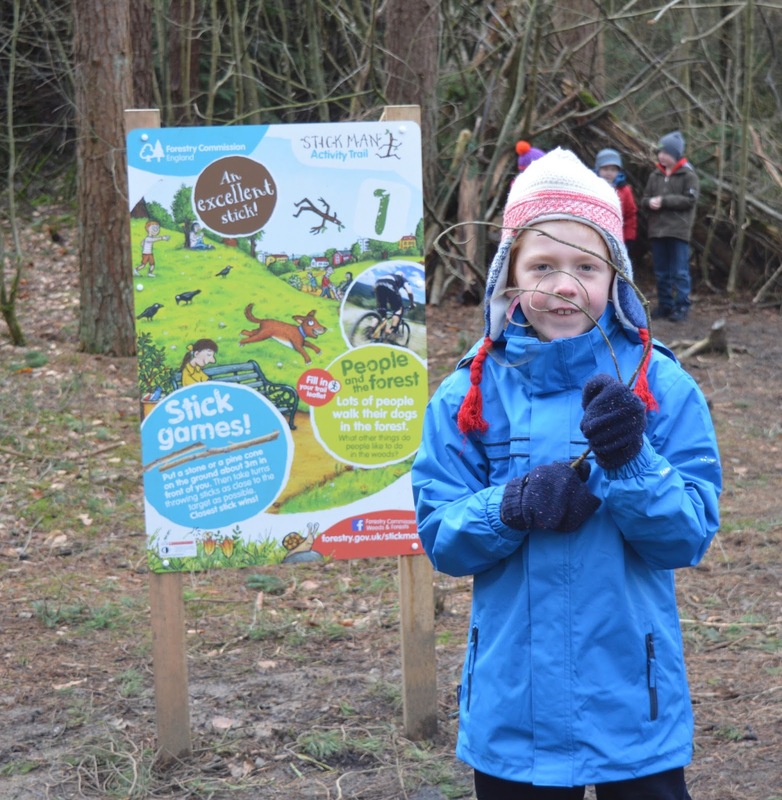 The Stickman Trail looks great and I love the look of the adventure playground. We have never been before but I think that Jessie would love it seeing as she loves the outdoors. 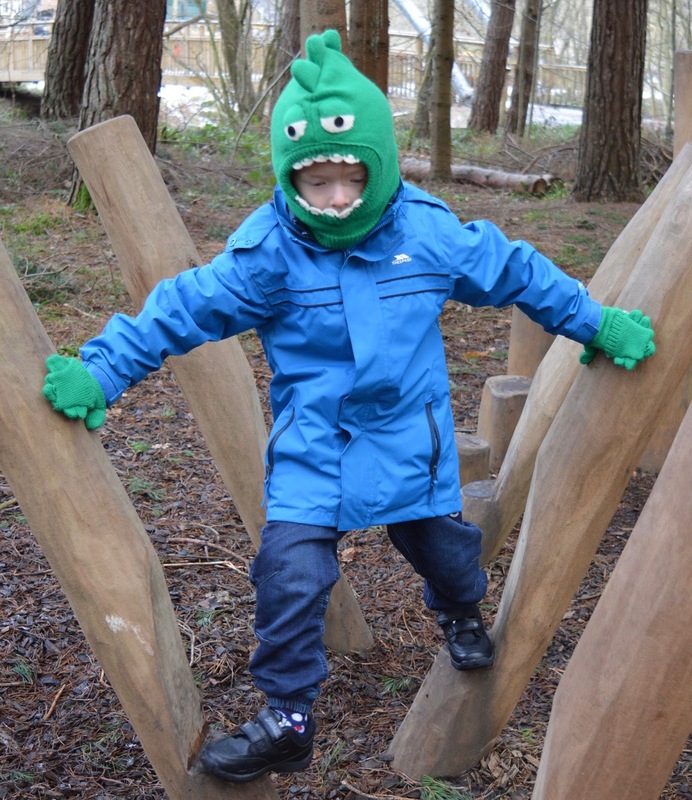 Still want to hide in your boot and come on one of your adventures!